Recently Laura Truax, Senior Pastor at LaSalle Street Church in Chicago, preached about one of our greatest fears: death. According to her, death is used by God to help us focus on life, on living fully, on becoming all we’re meant to be. 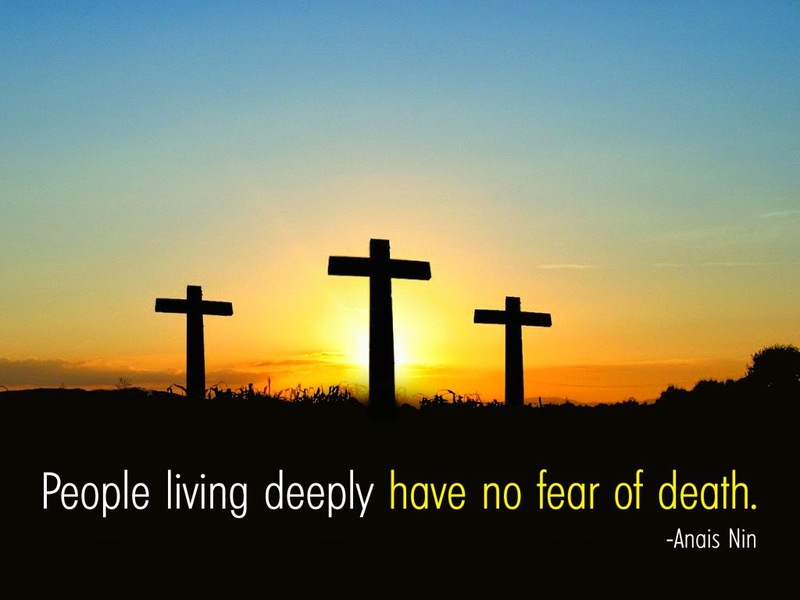 Death isn’t used by God to create fear in us or to be the final damning judgment on us - but due to Jesus victory over death, it’s meant to enliven us, to eliminate fear in us and to cause us to choose life and choose it fully each day. Lean into me - the "me" God imagines me to be. It’s there that I’ll find both him and myself and the community of saints that we are destined for if we will but lean in just a little bit each day. Try writing your own epitaph and share it with someone you love. Like me, I think you’ll find it will bring focus and joy to your journey. Second, I have a good friend of nearly 35 years now who has always said he thought life would be better lived backwards; i.e. start off old and die young. Aside from the obvious impossibility of this, it’s an interesting idea in light of Laura’s sermon. In this view, we start life with all the experience, knowledge, love and prioritized values that a life well lived might produce. Instead of learning this slowly as we live, we have it at the inception of a life lived backwards. For example, we could be better parents if we had grand-parented first; anybody who is or has been a grandparent knows this or better newly married couples, better students and so on. Since Jesus overcame death and promises the same victory for us, he has taken the mystery away and has given us an opportunity to embrace that which he already knows - that death has no sting - that in death we are made not less but more, we are not simply gone, but are in the presence of God, all the saints and in the hearts, minds and spirits of those we left behind. If we embraced this fully, made it a central point in our core of most closely held personal values, deep within our psyche, our soul; it would be like living backwards, living old to young, having all the keenly formed ideas of a life well lived at the beginning and through our life, not just at the end of our life. I believe this is what God wants for us - to so fully believe him, to trust him, to have our lives defined by that which he has already taken care of for us that we have no other real choice in life but to lean into our futures, fearlessly.